The Belleek shamrock lace candle holder was introduced in 2015. This Belleek candle holder features the embossed shamrock lace motif along with pierced shamrock shape openings, all on fine Irish china. The Belleek China shamrock lace candle holder includes a tea light for illumination. 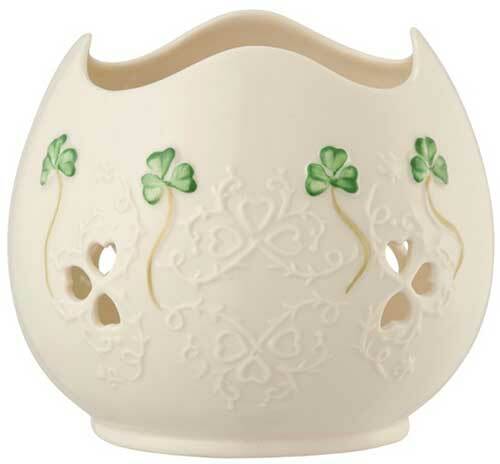 The Irish candle holder is enhanced with Belleek's famous hand painted shamrocks and it measures 4 1/2" wide x 3 1/2" tall. This Irish candle holder is handmade and hand painted in Belleek, Ireland and it is gift boxed with a shamrock history card, complements of The Irish Gift House.